A couple of weeks ago Arista Networks (ANET) reported their quarterly numbers and they were fantastic. No need to sugar coat the numbers, they were excellent. A decade ago I worked at Ciena and I remember when we started to see a new competitor in our market called Infinera. At the time Infinera came to market, Ciena was recording ~$100-120m quarters. Within a year of seeing them, Infinera was recording $8-20M quarters that had grown to $40M a quarter by mid-2006. Running a $500M business is vastly different than running a $150M business, which were the annual revenue runs rates for CIEN and INFN in 2006. Looking at the Arista results, the thought occurred to me to look back a decade. You, the entrepreneur, are trying to screw with the one thing the vast majority of people and businesses rely on to be successful: routine. Adopting some new, untested and unproven idea is simply not going to happen in the course of day-to-day operations. There’s too much risk that something could go wrong, and stuff always goes wrong with startups. Always. Successful entrepreneurs realize that if they find a person in some kind of agony and make their life a step function better, they will be able to identify more folks in a similar situation and sell to them too. On April 11, 2005, we entered into a long-term supply agreement with BTE Equipment, LLC, an affiliate of Level 3, for the supply of our DTN System and support services. On May 19, 2005, August 20, 2005, November 15, 2006 and February 23, 2007, we amended the terms of our supply agreement with Level 3. Certain of these amendments were entered into when Level 3 owned more than 5% of our outstanding shares. Pursuant to the agreement, we recognized $1.0 million of revenue in 2005 and $36.2 million of revenue in 2006. In addition, Level 3 acquired Broadwing in January 2007. We recognized $7.2 million of revenue from Broadwing in 2006. In June 2005, Level 3 purchased 2.6 million shares of our Series F convertible preferred stock and became a 5% stockholder. Following our sales of Series G convertible preferred stock, Level 3 still held 2.6 million shares of our capital stock, but is no longer a 5% stockholder. The Level 3 deal really helped fund and accelerate Infinera’s business. They went from a small, obscure nuisance, to a legit player showing up in all parts of the market. The left hand chart shows the ten-year annual revenue trend for both companies. The big uptick for Ciena is the result of their acquisition of Nortel’s Optical Business unit, which filled in the global footprint of PTTs that Ciena had yet to acquire as customers. 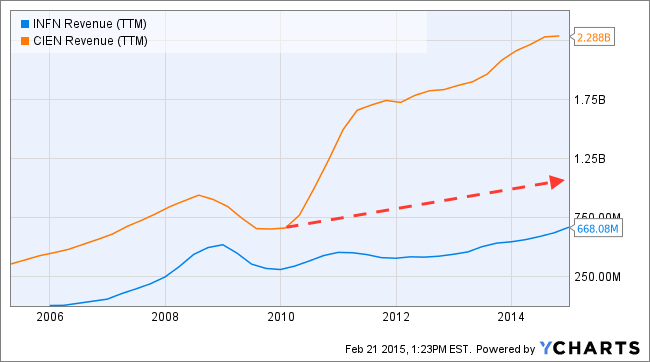 I supper imposed the red arrow line just as a run rate trend had Ciena not acquired Nortel’s optical business. The important trend to note is that ten years later, Infinera is a legit player. They still do not have the resources to fight all battles in all markets, much like the Ciena I fondly remember from 2005-2006, Infinera seems to be showing the ability to focus their efforts and punch above their weight class, but they do need to pick their fights carefully. When I reviewed the Arista results, I tried to think how the Cisco switching business unit leaders would view the results. From one perspective, the Arista team has been able to build a wonderful business within Cisco’s core business, but when you look at the numbers does it really compare? 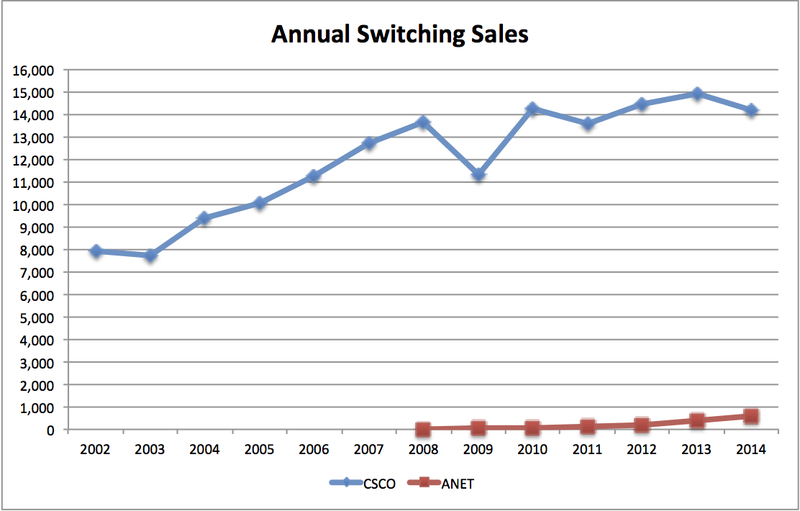 All the stuff Cisco sells in the switching and data center categories add up to $14B a year. $14B! That is a huge number. If you are sitting around as the business leader for this staggering amount of revenue and a staff member runs in and says a competitor is selling $600M or 4% of your revenues, do you care? The problem plucky startups cause, is if they can find a few people in some kind of agony and make their life a step function better, then they will be able to find more and ten years on, they have a successful business. It does not happen overnight and this is why I think Cisco is talking active measures to stem Arista’s growth. Throw a few lawsuits at them, focus the development teams on competitive product responses and incentivize the sales teams to win market share back, because a competitor left unchecked becomes a bigger problem overtime.